Ian has achieved great success on the London and National comedy circuits and is a regular headliner at London’s famous Comedy Store. 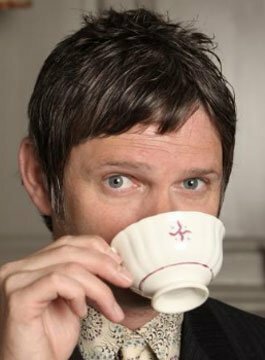 Almost single-handedly leading the resurgence of all things mod, Ian splits his time between living in the South of France with his family and performing in the UK. Besides being a regular on BBC 5 Live’s Fighting Talk and BT Sport’s The Football’s On, Ian performs at a large number of corporate events. He’s performed at events ranging in size from 12 people in a suite for Harley Davidson through to thousands at the Excel Arena. One of the most in-demand corporate awards hosts and after-dinner speakers, Ian Moore, is also a best-selling author with his novels “A La Mod” and “C’est Modnifique – Adventures of an English Grump in Rural France”. Ian’s laconic observations on life, from the problems of using the wrong vocabulary in a German Pizza Hut, to an almost pathological hatred of most forms of physical exertion, have proved hugely successful with live audiences all over the world from Australia to China, and the Philippines to the Middle East. Following a sell-out run at the Edinburgh Festival where he appeared with Catherine Tate, Ian was one of only seven British comics selected to perform at the pinnacle of all comedy festivals – Montreal’s Just for Laughs. Alongside the likes of Jimmy Carr, Ian performed in the sell-out Britcom showcase proving to be such a success he subsequently went on to headline the Worldcom show at the festival’s finale. Ian was also, briefly, the warm-up comic for the BBC’s ‘Friday Night with Jonathan Ross‘ show. Comedian Ian Moore has headlined at the Reading and Leeds music festivals, but he is too well dressed to consider appearing at Glastonbury! Our event was great on 16th November and a large part of that was down to Ian. He ensured the evening run smoothly within timings and was very engaging with the audience. We have had a lot of great feedback about his hosting skills. Ian was fantastic. He fully met our criteria whilst matching the tone perfectly with humour but also recognising the importance of the awards being given out on the night. The audience was a little cold to start (as expected) but once they settled down they were impressed with him and by the end of the night they were in full swing and thoroughly enjoyed themselves. Ian was very professional and a delight to work with, very easy going. He incorporated a number of our sponsor names into his set which went down very well. The audience responded really well to his humour which I think was very funny and just what we needed after a long conference day. I just wanted to say a huge thank you to Ian for making the Bett Awards 2013 such a brilliant night. There has been lots of great feedback on the Awards, especially Ian's performance which was really well received. And his co-hosting with Philippa Forrester, they worked so well together. It was such a pleasure to work with Ian as always. Please pass on my thanks to him for his wonderful performance and impressively professional hosting! Ian was a joy to work with. Ian had appeared as the entertainment at our annual dinner previously but this was the first time we had combined the dinner with an awards ceremony. Ian’s professionalism and his hosting abilities ensured the event was a great success. Ian’s material was very well received by the audience. I’m sure he gained some new fans and advocates. He hit the tone required perfectly. Pound for pound the best available. You were bloody brilliant last night! I really enjoyed your act – I thought you judged the audience & vibe excellently, and deservedly got many laughs. And I also enjoyed working with you on stage. You were so very relaxed & adaptable, coping unflappably with the occasional oddities and handling it all impressively. Many people commented on how great you were, which was lovely to hear”. Absolute pleasure to have you on board for the Cardiff Life Awards and I hope our paths cross again. I’ll make sure we send a copy of the Awards issue.